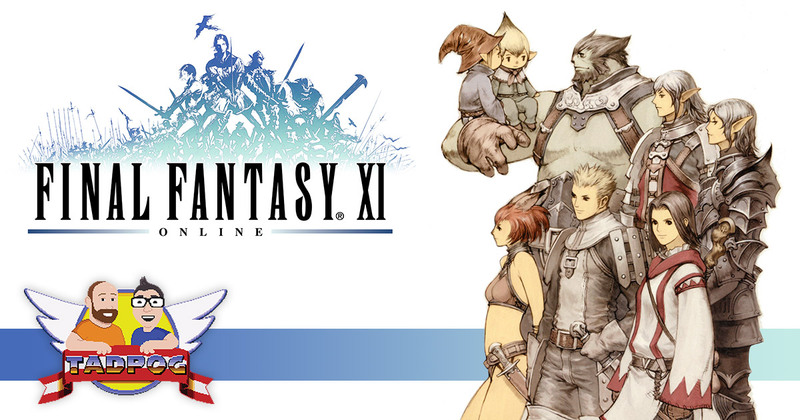 Put your party flag up because this week we are talking about Final Fantasy XI, the 2002 MMORPG by Square. We have wanted to do an episode on this game for a long time and we are joined by our resident MMOlogist, Shawn Miller of #MoreMiller fame. All three of us played Final Fantasy XI at its height and in this episode we barely scratch the surface of this immense game, but we do have a lot of fun reminiscing about our time spent in Vana’diel. We open a new package full of treats from listeners Bunny and Kira. We tell stories about our gross early apartments. Dave contributes to the stray cat population epidemic. And perhaps most notable for TADPOG Lore Masters, He Who Shall Not Be Named…is named. We had so much fun recording this one that we would like to continue it some day; we hope you enjoy. Remember all those other episodes where Miller joined us? Like Pilotwings, Populous, Secret of Evermore, his interview, Mega Man X2, Rygar, Final Fantasy II (Part 1) and (Part 2), Patron Saint Zach’s interview, Final Fantasy III, Tomb of Horrors Actual Play, Ready Player One, Cool Spot, Back to the Future, and the Great Patreon Video Game Quiz? This game is still running! Here’s proof.